Spanish Tees at The Children's Place for $6 each! 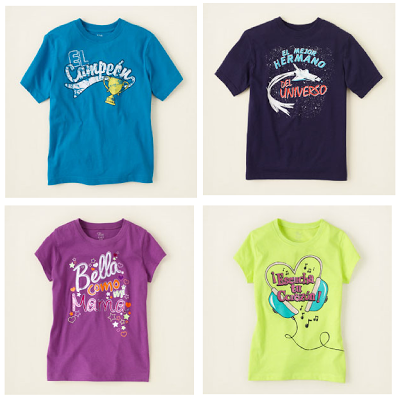 Check out these graphic tees from the Children's Place, that are written in Spanish! I know my bilingual kids will be so proud to wear them. These camisas are on sale right now for Big Kids $6 and Little Kids $5! See them all by searching for "spanish" on the Children's Place website. I'm picking up these for my boy/girl twins! With an additional 15% off code on the site's homepage, G2M3713...you can't beat the price! They are so cute, I had to share...You're Welcome!